"Richly textured and exhaustively researched...fresh clips and new voices that make Ali come alive... a gift." "Magnificently concise... makes you feel [Ali's] radicalism all over again." "May very well be the best sports documentary so far this decade. Carries within each frame a sense of vitality and power that is rarely seen in a documentary of this ilk... Sports fans take notice, your favorite film of the year may have just arrived." "Bill Siegel’s audacious documentary puts new heat and focus on what an extraordinary figure Muhammad Ali was outside the boxing ring. No film has probed this deeply into the fallout from his name change or his complex bond with Malcolm X and the Nation of Islam. And the saga of Ali’s refusal to be drafted during Vietnam becomes a profile in courage — a tale of shocking vilification and faith lost and found. A-"
"With the freshness and urgency of unexplored history, Siegel’s film allows us to set aside the goggles through which we view Muhammad Ali today... sheds fascinating new light on one of the most elusive and complicated public figures of the 20th century. Anyone who wants to understand what happened to America during those turbulent years needs to see this film." "A wholly illuminating look at Muhammad Ali in all his complexity, providing a surprisingly fresh and vivid portrait of a man who played rope-a-dope with history, religion and sport and emerged from the ring as an inspiring, and flawed icon." "The best Muhammad Ali doc I've ever seen and - dare I say - I've seen 'em all." — Dave Zirin, The Nation. "Masterful... so engrossing it can't help but pull you in... one of the best documentary experiences of the entire year." "I think much of this film will surprise people. Shocking from many angles." — Judd Apatow, film director/producer. "A passionate portrait of an exceptional young man growing up in the spotlight, grips us from the very beginning." "A must see and a sobering reminder of what we owe Ali." "It was Muhammad Ali, as a young person in my formative years, that really brought home the issue of race, of the Vietnam War, of religious freedom. No sports figure on the planet ever did before." — Khalilah Camacho-Ali talks to BlackAmericaWeb.com. "I've seen a lot of Ali documentaries over the years, but I don't recall seeing a film that was as intimate about his youth." "Captures that time vividly... Siegel does a fine job of stripping away historical whitewash"
"Ali is infectious and magnanimous. It is difficult to watch the movie and not fall in love with him all over again. But Siegel is not just building up Ali as hero, but suggesting that we have lost something about his history which made him truly heroic." "A fascinating look at Muhammad Ali as a cultural figure... as a civil rights hero on the level of Dr. Martin Luther King"
"The Trials of Muhammad Ali is a knockout." "Not the first documentary to be made about the boxing legend, but it's certainly the most essential... Remarkable, fascinating, inspiring"
"Ali wasn't just a gifted fighter. He was simply gifted. The footage from this doc makes your eyes refrain from blinking." "This Ali biopic is doing something that other Ali documentaries have not done — focusing on the cultural and social influence of the heavyweight boxing champ outside the ring." "Hard-hitting yet delightful... this well-crafted doc packs a wallop!" "A taut, well-paced historical documentary." "For those seeking further insight into this sliver of Ali’s remarkable career, “Trials” is as comprehensive as it gets." "The Trials of Muhammad Ali is an extraordinarily detailed and textured examination of the man, the time, and the societal forces involved." "An intriguing portrait of a man who never wavered, no matter what the world threw at him, which was a lot." "Has the heart to match its subject... an intense, focused narrative with hard-hitting relevance... nothing short of masterful." 4 Stars! "Watch and understand that "The Greatest" is far more complicated, and far greater, than you'd ever realized." "Siegel digs deep to build a fascinating mosaic of Ali during this incredible stretch of his life... The Trials of Muhammad Ali makes a convincing argument that the nickname [The Greatest] was correct for so many reasons." "Distinct and important and engaging and well crafted and focused... It’s a look at a history by way of Ali, and it’s a look at Ali by way of history, and it’s one of the best docs I’d claim to have learned something from all year." 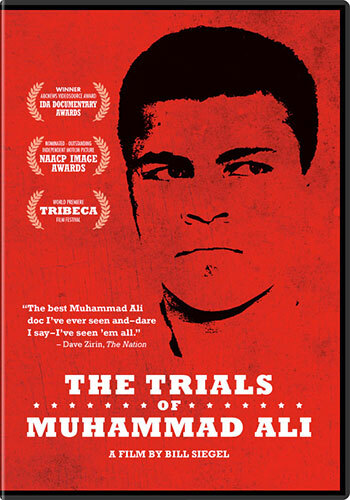 "The Trials of Muhammad Ali stands with the best of the Ali documentaries and is a valuable addition to the historical record. The film is compelling, entertaining, moving, and informative; a reminder of how exciting and polarizing Ali was when he was young." "This is a special film. It should be treasured by anyone who cares about sports, politics, the 1960s or the vivacious, loquacious, bodacious, Muhammad Ali. There are those I’m sure who will always believe that no film could possibly do Ali and his era justice. They should on principle see The Trials of Muhammad Ali, and then, humbled, find Bill Siegel and say his name." "Vivid... Ali now stands as a model for political protest and social justice, and the film shows how this status was born of these trials." "Lively, illuminating... a riveting, rounded portrait of Ali... admirably does not shy away from the contradictions and ironies of its subject... makes a powerful case that this largely hidden period of Ali’s life is crucial to fully understanding this remarkable man." "Fascinating... eye-opening in a number of ways... exhilarating to watch." "Elegantly told with deft use of archival footage." — Pat Aufderheide, Center for Social Media, American University. "Expect this to be well-put-together, sharply political, smart as hell, and an entirely useful addition to the canon." "Wonderful... it’s often funny and ultimately is an ode to Ali as an inspirational and principled man." "An invigorating doc brings the long-forgotten controversy to life... captures the thrill of Ali's personality even for viewers with little interest in the sweet science." "Director Bill Siegel (The Weather Underground) chooses to focus primarily on Ali’s fights with the American establishment over his chosen Muslim identity, which makes for a shrewd and provocative post-9/11 commentary. From throwing punches in the ring to verbal sparring with news commentators and college students, Ali is shown as a man constantly at odds with those around him, staying faithful to the Nation of Islam and his criticisms of the Vietnam War, no matter the cost to his livelihood. The film could be called “Muhammad Ali vs. The United States of America.” With a vast collection of archival clips and interviews, the film moves along at a swift clip while raising thorny questions about race and religion in this country." "THE TRIALS OF MUHAMMAD ALI is simply put the best film on Ali the man that I've seen... The film will move you. One of the best of Tribeca and the year." "In its portrayal of a hyper-confident motormouth, "The Trials of Muhammad Ali" leaves a clear impression. The fighter shook up America--and its assumptions about race--by being the opposite of Jackie [Robinson]: always talking, always reacting, always provoking."